Throughout his extraordinary career, New World Library cofounder and publisher Marc Allen has developed simple, powerful tools that anyone can use to find a short, direct path to success and fulfillment. In The Magical Path: Creating the Life of Your Dreams and a World That Works for All, he presents these tools. The book is filled with effective, easy-to-apply practices — including affirmation, visualization, and guided meditation — that can change the course of readers’ lives in miraculous ways. We hope you’ll enjoy this short excerpt from the book. Throughout his extraordinary career, New World Library cofounder and publisher Marc Allen has developed simple, powerful tools that anyone can use to achieve success and fulfillment. 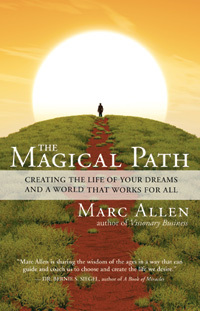 In The Magical Path: Creating the Life of Your Dreams and a World That Works for All, he presents a short, effortless route to success and fulfillment. The book is filled with effective, easy-to-apply practices — including affirmations, visualizations, and guided meditations — that can change the course of readers’ lives in miraculous ways. We hope you’ll enjoy this short excerpt, in which Marc eloquently affirms his deepest beliefs about this adventure called life. I can’t believe it. We’re celebrating forty years of publishing at New World Library. And it was all something I just stumbled into. Or maybe I was guided into it by forces far beyond me — who knows? In my twenties, I spent most of my time in what we called the “spiritual smorgasbord” of the San Francisco Bay Area. When I was twenty-eight — in 1974 — I met a young woman named Shakti Gawain. She was two years younger and had just spent a year in India. We went to a weekend workshop led by a man named Ken Keyes, Jr., based on his book Handbook to Higher Consciousness. It was an incredible experience, and Shakti and I became close heart friends and partners. What is the main difference between a successful writer and an unsuccessful writer? It’s not the quality of the work. A lot of very good writers are not successful. It’s a matter of how much the writer understands how the publishing industry works, and how they can best present their work and find their audience. The first thing I tell beginning writers is this: Study the industry. Get to know how it works. Read things about it. Ideally, go to the big annual publishing convention, Book Expo America. It’s not for everybody, and it can be overwhelming for some people, but the entire book industry is spread out in one huge room, and you can learn a tremendous amount about how it all works. It’s in late May and early June in 2017 in New York City. Or go to local writing and publishing events. 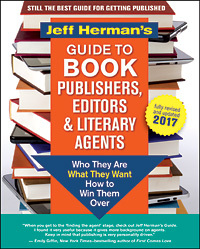 And get this book: Jeff Herman’s Guide to Book Publishers, Editors & Literary Agents. In the eleven years that I have been a part of New World Library’s publishing team, my life has been deeply affected by the relationships and conversations I have been fortunate enough to have with our authors. They are truly at the forefront of helping to create a new paradigm in this world. The awareness and practical tools I have gained inspired me to want to create and host a New World Library podcast, to provide an outlet where I can dive deeper with our authors, in a more intentional way, while sharing their wisdom with others. There is one simple little practice that can transform every company in the world — large and small — into a profit-making powerhouse. I say this as the owner of a highly profitable company. Most successful publishing companies have profits in the range of 5 to 10 percent of their income. Ours is usually around 20 percent and has been as high as 36 percent when we’ve had a bestseller. What’s our secret? It’s very simple. . . . When I first started New World Library, I knew nothing about business. I had never taken a class in it. But I read business books voraciously for a while. And then I read a magazine article that changed my company — and changed my life — quickly and dramatically.